Bruce Adolphe | The Chamber Music Society of Lincoln Center. 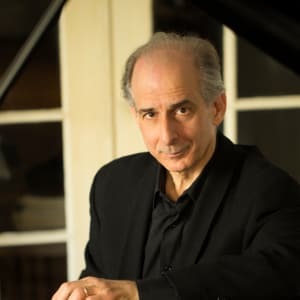 Composer Bruce Adolphe has written music for many renowned musicians and ensembles, including Itzhak Perlman, Yo-Yo Ma, Joshua Bell, Sylvia McNair, the Brentano String Quartet, the Beaux Arts Trio, the Washington National Opera, the Metropolitan Opera Guild, the St. Paul Chamber Orchestra, the IRIS Orchestra, Orpheus Chamber Orchestra, Los Angeles Chamber Orchestra, and the Human Rights Orchestra of Europe. Recent performances include Daniel Hope playing Mr. Adolphe's violin concerto I Will Not Remain Silent (inspired by the life of the human rights activist Joachim Prinz) with the Philharmonie Essen, Germany, conducted by Jaime Martin; the world premiere of I saw how fragile and infinitely precious the world is, based on a text by the late astronaut/scientist Piers Sellers at the Off the Hook Arts Festival in Colorado; the opera Emma and the Blue Baku performed by musicians from the Civica Scuola di Musica Claudio Abbado in Milan; the world premiere of Out of the Air for clarinet, cello, and piano at Ocean Reef Festival; and Mr. Adolphe's Musics of Memory (piano, harp, marimba, guitar) which was performed in connection with a talk by neuroscientist Assal Habibi at the Aspen Science Center. Additionally, Mr. Adolphe has contributed a chapter to the forthcoming book Secrets of Creativity, a collection of new essays by neuroscientists and artists, to be published this fall by Oxford University Press, edited by Suzanne Nalbantian. Recent recordings of Mr. Adolphe's music include Chopin Dreams performed by the Italian pianist Carlo Grante on Naxos American Classics label; and Einstein's Light performed by violinist Joshua Bell and pianist Marija Stroke on Sony Classical; and The End of Tonight (three mezzo-sopranos, three cellos, and piano) a digital release on the St. Urban label. Mr. Adolphe is currently composing works commissioned by: the Chamber Music Society of Lincoln Center for the 50th anniversary season; the Brentano String Quartet Beethoven year project; the River Oaks Chamber Orchestra in connection with the opening of the newly renovated Holocaust Museum of Houston; the Da Capo Chamber Players for their 50th anniversary; and the Dorian Wind Quintet. In addition to composing, Mr. Adolphe holds several positions concurrently: founder and director of the Meet the Music! family concert series and resident lecturer at the Chamber Music Society of Lincoln Center; creator/performer of public radio’s weekly Piano Puzzler on Performance Today; co-artistic director of Off the Hook Arts Festival in Colorado; founder and creative director of The Learning Maestros. The author of three books on music, Mr. Adolphe has taught at Yale, The Juilliard School, and New York University, and was recently appointed composer-in-residence at the Brain and Creativity Institute in Los Angeles. The second edition of his book The Mind's Ear: Exercises for Improving the Musical Imagination was published by Oxford University Press in 2013.